On 3 March, the LNA claimed it had entered the town of Qatrun. On 28 February, the High Social Council of the Libyan Tuareg announced that the LNA had peacefully entered Ghat and al-Awenat. On 1 March, the LNA officially confirmed its control over Umm al-Aranib. On 4 March, the NOC officially lifted force majeure on Sharara oilfield. 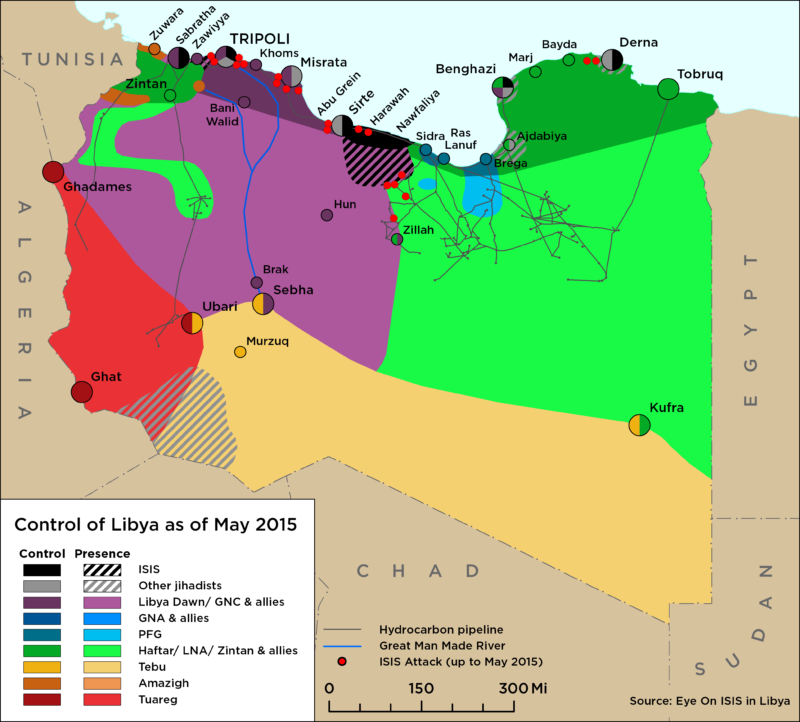 On 1 December, the Libyan National Army arrested five ISIS members in Ubari. On 30 November, ISIS released its Naba newsletter No. 158 that featured an article detailing the group’s attack on the town of Tazirbu. On 30 August, Serraj appointed a Chief of Staff of the Libyan Army under the GNA, a move rejected by the LNA. On 1 September, a Zawiyya militia attacked a demonstration in commemoration of Gaddafi’s revolution, organised by local rivals affiliated with the LNA. Last week, US AFRICOM concluded Operation Odyssey Lightning in Sirte while support is being given to the Stabilisation Facility for Libya. On 23 December, an internal Libya flight was hijacked and flown to Malta, where the hijackers were apprehended. 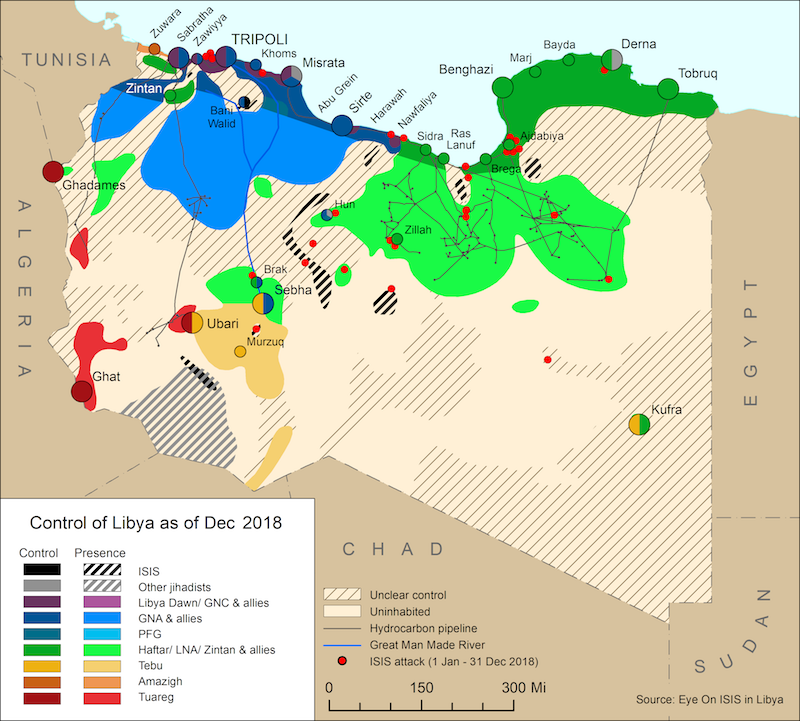 PM Fayez Serraj and his allies are taking active measures to entrench the GNA’s de facto control in the capital by creating new security forces and appointing ministers, provoking fears in Eastern Libya that the GNA intends to ‘go it alone’. In Tripoli, tensions are growing between RADA and BRSC, with two RADA officers assassinated last week. In Benghazi, there was an assassination attempt against the head of the Magharba tribe while the GNA MoD is believed to be allying with BDB militias. GNA Defence Minister Mahdi al-Barghathi condemned Haftar and the LNA last week, accusing them of carrying out assassinations and human rights abuses in eastern Libya. The LNA fears Barghati is allying with BDB militias and Jadhran loyalists to launch a counter-attack on the oil crescent.